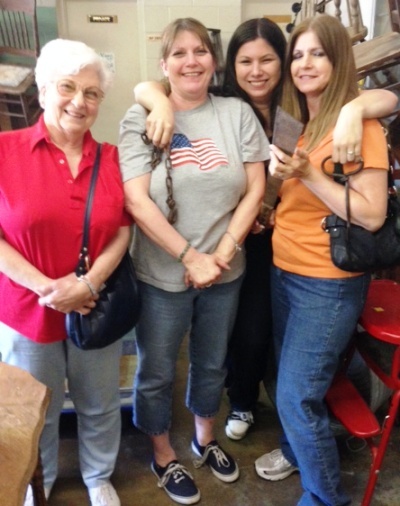 My sister Debbie and her daughter Ashley, both from Broken Arrow, OK, spent the weekend in Joplin. Along with my other sister, Linda, and my mom, we had a great time chatting and laughing, sharing meals, dropping in on my daughter Adriel at work, sitting around my fire pit last night, and today, visiting flea markets. Wanting to check out a new store this afternoon, for my first, the five of us headed to Carthage, MO. Carthage is a beautiful, historic town, and the ideal place for shopping in vintage shops and flea markets. Except, apparently, on Sundays! After our group enjoyed a fun lunch with my son, Nate, who was on patrol today, we drove around the beautiful town square. I had a destination in mind. But as we pulled up in front of the store, we spotted a large sign in the window stating, “No longer open on Sunday”. Not to be deterred from a first, we flowed, we rolled, literally on around the square. We found Goad’s Antique Mall open on the north side of the square. 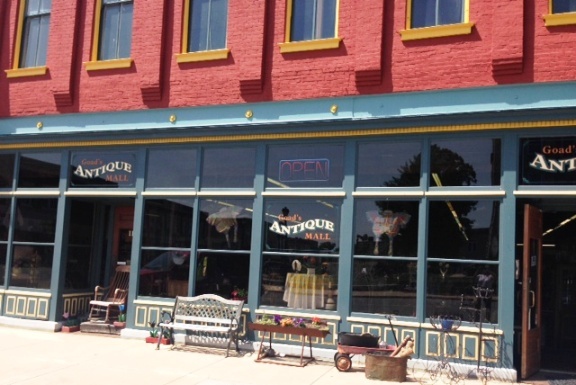 Located at 111 E. 3rd Street, Goad’s is packed with antiques, collectibles, primitives, furniture and fun junk. I love browsing through a flea market or antique store. You never know what you will find. And there are so many treasures to sort through, pick over and examine. Each of us had specific items on our wish list: Linda was looking for a dresser or a small table and chairs set, my mom likes unique jewelry and garden finds, my sister Debbie and niece Ashley, who host an incredible Halloween party each year, were searching for items that could be transformed into decorations. And I was looking for metal containers and an old chair to use in the garden. Parked right beside the front door was a round metal washtub on a stand. Perfect! I love the first washtub I found and have it in my garden already, filled with plants. I was hoping to find another and here it was. 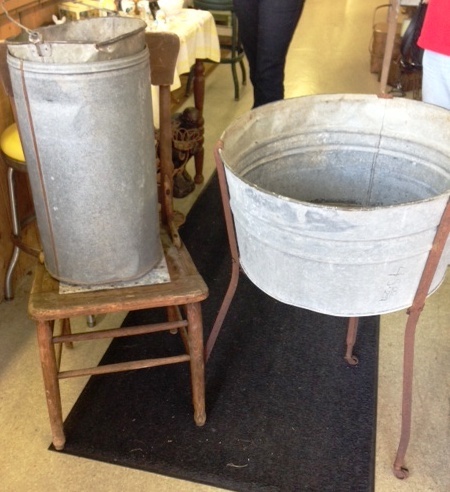 I also found a slightly battered metal bucket and another tall metal container to use as planters. And there hanging on a wall in the marvelously crowded back room was an old wooden chair with a metal panel screwed to the seat. This wonderful find was only $10. I have a couple of enamelware basins that I want to use in the garden. Filling the basins with dirt and flowers, they will then be perched on the seats of old chairs and placed in the backyard. This was my first chair and I had found it at a bargain price. There were actually several $10 chairs. I selected this one because I liked that the woven seat had been replaced with a square of metal. My niece, Ashley, provided much amusement as she searched for wicked looking objects to use as Halloween props. She began to remind me of the quirky character Wednesday, from the Addams Family movies , as she expressed glee over such finds as hay hooks, saws, tongs, and chains. I look forward to seeing how she uses these items at her party! We left Carthage very satisfied with our purchases. Once again, I was directed onto a slightly different path and obviously ended up exactly where I was supposed to be. These seemingly insignificant experiences are teaching me so much about how life flows and how I can resist the flow and create discomfort and disappointment for myself, or I can be receptive, accepting the changes, and open myself to delightful surprises. I see how going with the flow brings joy. May I allow these experiences to continue opening me to the larger truths about life and walking the path of non-resistance.